In life it’s not the peaks that define us but the valleys. Dani McCrobie is an excellent example of persistence. When life pushes you to the breaking point a person has two choices. . . . get up or lie down. Dani McCrobie chose to push past her limitations. She proved to be resilient, brave and passionate to continue the pursuit of her dreams. West Virginia Junior College, Morgantown is excited to present Dani McCrobie’s student highlight. When most little girls are dreaming about becoming a princess, cheerleader or a movie star, Dani’s goal was to be a member on a cardiopulmonary transplant team. Parents always tell their children to dream big . . . Dani took this advice to heart and did just that. To accomplish such a dream requires education, intensity, training, and perseverance. As a WVJC student Dani has demonstrated intensity in her passion, diligence in her training and constant perseverance in both academic and personal pursuits. At the age of fourteen, Dani suffered a spinal cord injury during gymnastics training. This injury led to the detection of other health-related problems which resulted in a harsh reality. Dani was diagnosed at eighteen with postural orthostatic hypotension syndrome and hypermobile ehlers-danlos syndrome. At the age of twenty-one she has endured twenty-three surgeries. Through these health related issues, Dani did not succumb to the devastation or setbacks. Dani continued with uninterrupted effort. As Dani’s health stabilized she made a decision that impacted her life. Dani decided to pursue her degree as a Clinical Medical Assistant. WVJC presented her the opportunity to begin her medical training in an environment that was supportive, encouraging and provided individualized attention. 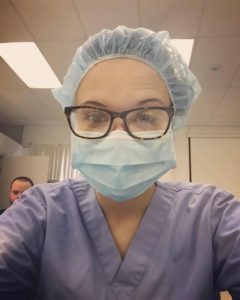 “Thanks to West Virginia Junior College, I have been given 18 months to improve my heath while continuing my education in biochemistry while working as a Medical Assistant.” No matter what Danielle has faced in her life she continues to strive for her ultimate goal. Life has a way of challenging us. Dani was faced with a medical reality that could have destroyed her dreams. She was able to meet each challenge with courage and enthusiasm. West Virginia Junior College is privileged to be a part of Dani’s educational journey.